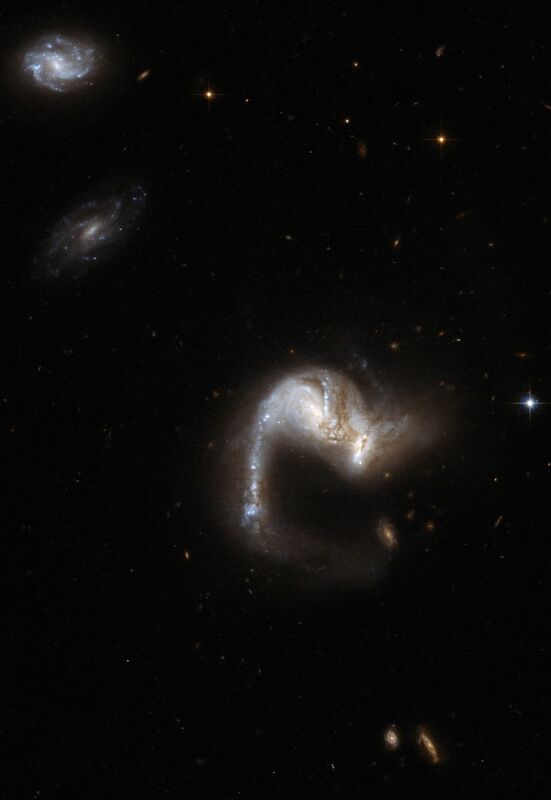 UGC 4881, known as the "The Grasshopper," is a stunning system consisting of two colliding galaxies. It has a bright curly tail containing a remarkable number of star clusters. The galaxies are thought to be halfway through a merger the cores of the parent galaxies are still clearly separated, but their disks are overlapping. A supernova exploded in this system in 1999 and astronomers believe that a vigorous burst of star formation may have just started. This notable object is located in the constellation of Lynx, some 500 million light-years away from Earth. UGC 4881 is the 55th galaxy in Arp's Atlas of Peculiar Galaxies.